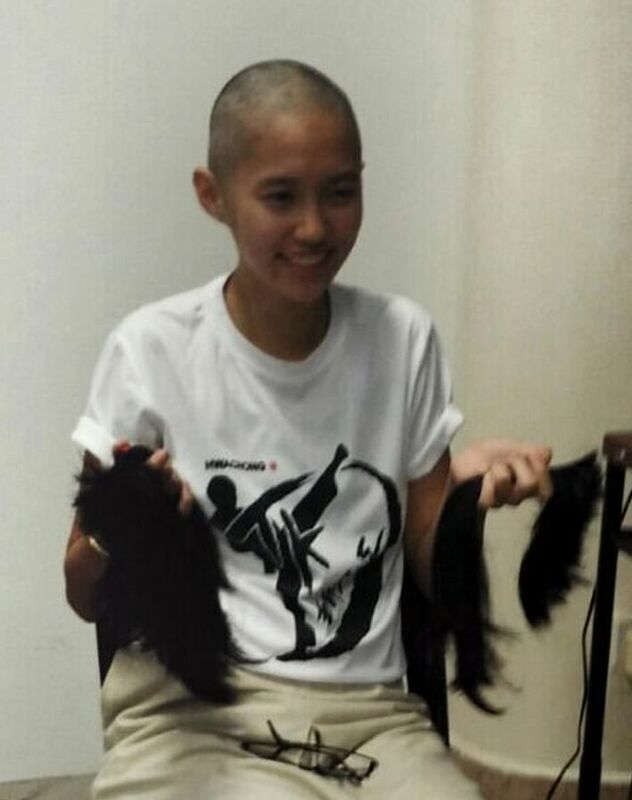 When the razor touched the head of Hwa Chong Institution student Nicole Lee Wen, 17, she almost backed out of the shave. It was the first time she was participating in Hair for Hope, an event which raises funds and awareness of childhood cancer. It is organised by the Children's Cancer Foundation, a non-profit organisation, and involves people volunteering to have their heads shaved to show solidarity with cancer sufferers who lose their hair during treatment. Every shaven head at the event represents the understanding by an individual of the ordeals that a child with cancer is subjected to. Volunteers help raise awareness of childhood cancer among their family and friends, and rally support from the public in the form of donations. Although Nicole got cold feet, she eventually submitted to the razor. She says: "The thought that carried me through was the fact that I had the choice to shave my head. I reminded myself that I was doing it for the people who didn't have the same luxury." The thought that carried me through was the fact that I had the choice to shave my head. I reminded myself that I was doing it for the people who didn't have the same luxury. She is among the many girls who have taken part in the annual head- shaving campaign, since it started in 2003. This year, the organisers recorded more than 6,000 participants who had their heads shaved at a two-day main event at VivoCity last week, as well as 52 satellite events held at schools, corporate offices and grassroots organisations. The number of female students who participated is still being tabulated and was not available at press time. Edgefield Primary pupil Amelie Tang, 11, says she participated after watching a documentary on children suffering from cancer. She says: "I wanted to show my support by shaving and telling these children that it's okay to be bald. I also wanted to encourage them not to give up easily." She adds that she is "happy" with the outcome and that not having hair on her head is "cooling". But when she visits public toilets, she notices people giving her weird stares. She says: "To people I know, I will take the opportunity to talk about how the event creates awareness of what the child cancer patients go through and why I am doing this." Zara Yong, 11, a student at the United World College South East Asia (Dover campus), had her head shaved last Saturday and has raised more than $35,000 for the cause with the help of her family, friends and supporters. She says: "After the shave, it does feel a little awkward. I am used to putting my hands through my long hair. But no one treats me differently." Her mother, writer and life coach Zerlina Sim, 43, says: "I am thrilled that Zara took up fund-raising for a worthy cause and am excited to support her all the way. Her grandparents, family and friends also attended the event to cheer Zara on." Boys who participated say their female counterparts are often seen as "braver". Cory Adam D'Silva, 12, from Montfort Junior School, says: "When people see a girl being so brave as to shave her hair, they will be more compelled to donate and help her raise funds." Ten schools and two polytechnics participated in Hair for Hope this year. They are Hwa Chong Institution, Raffles Institution, Kong Hwa School, Edgefield Primary School, Montfort Junior School, Montfort Secondary School, St Joseph's Institution International, St Gabriel's Secondary School, Holy Innocents' Primary School, Victoria School, Ngee Ann Polytechnic and Temasek Polytechnic. Shaving for the event is a voluntary act and schools do not ask students to participate. Students under the age of 18 have to submit parental consent forms to the organisers as well as obtain consent from their schools. In 2013, five students from St Margaret's Secondary reportedly shaved their heads and their principal took three to task for not wearing wigs to school as promised. The principal later made a U-turn, allowing the girls to attend lessons without wearing wigs.